Você deseja que os dados? Temos de dados. You Want Data? We've Got Data. Beginning in June 2016, we sent online surveys about lower back pain to all students enrolled in our group 6-lesson Gokhale Method Foundations course. We chose the Roland-Morris Questionnaire , and emailed it to students 3 days before, just after, and 4 weeks after the course. All submissions were done anonymously and voluntarily. We are pleased to present our results here. What is the Roland-Morris Questionnaire? The Roland Morris questionnaire (http://www.rmdq.org/) lists 24 statements about the influence of back pain on daily activities. Subjects are asked to check a statement if it applies to them on the current day. For each questionnaire, the number of checks marked by the subject is counted. It’s a validated and frequently used questionnaire for lower back pain research. It is thoroughly tested for sensitivity to changes in lower back pain. It has been translated into and validated in numerous languages. The authors permit online usage of the questionnaire. Until recently, we did not have the skillset to conduct a conscientious study in house. Our new staff members, Björn Krüger (Computer Science) and Jonas Müller (Physics), have strong academic backgrounds that extend to data analysis. They set up, conducted, and performed the data analysis for the study presented here. All students of Gokhale Method Foundations group courses between June 2016 and Jan 2017 were invited to be participants in the study. No exclusion criteria were formulated, as one of the study’s goals is to have our participants demographics fully represented. Students responded to the surveys on a voluntary basis without any rewards.There was no control group in this study. 4 weeks after the last lesson of the course. Emails included links to an online questionnaire; the links expired 72 hours after the email was sent. Fig 1: Method: The survey is based on the Roland-Morris Questionnaire For Lower Back Pain. The questionnaire is filled out by participants three times before and after taking the Gokhale Method Foundations course. In total, 267 people participated in at least one of the three surveys they were invited to. We received 191 answers to the first survey (S1), 111 answers to the second survey (S2), and 69 answers to the third survey (S3). The dropout rates in our survey were quite high. We checked for a correlation between initial pain levels and dropout rates and found none. Figure 2 shows, that the mean values of marked ticks dropped from 4.0 in S1 to 2.6 in S2 to 1.9 in S3. Fig. 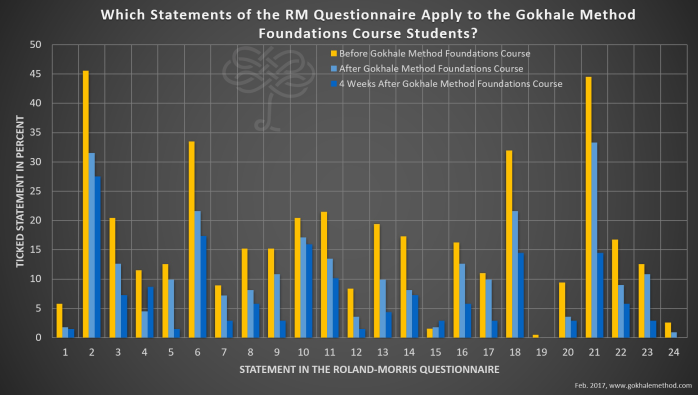 2: Change of mean values of number of checked pain-related questions from the Roland Morris Pain Questionnaire due to Gokhale Method Foundations course. Unpaired test. Fig. 3: Pie charts showing the number of ticks in the questionnaire. Before participating in the GMF 21% of the subjects report no lower back pain (dark blue segments), after the GMF it is already 37%, 4 weeks after the GMF 53%. Figure 3 shows, that the number of people that don’t tick any statement in the questionnaire increases from 21% to 37% up to 53% after four weeks. This reduction in pain levels can also be tracked by looking at the median values: The median drops from 3.0 before the course, to 2.0 after the course to 0.0 after four weeks. Based on these answers an unpaired test (Mann-Whitney U test) was performed. The p-value between S1 and S2 is 0.0005 (that is to say, the probability that there was in fact no improvement is less than .05%), between S1 and S3 is 7·10-8, and between S2 and S3 is 0.008. Fig. 4: For each statement of the Roland-Morris Questionnaire, the percentage of participants that ticked the statement is shown. The percentage decreases for most of the statements. The responses to questions 2, 6, 11, 18, 21 show especially large improvements. Additionally an analysis of improvement in different areas was performed. Figure 4 shows the average number of ticks before, after and 4 weeks after the Foundations Course for each statement of the Roland-Morris questionnaire. The complete list of questions within in the questionnaire can be found at the end of this article. 62 participants filled the first (S1) and second (S2) survey, 33 participants filled the first (S1) and third (S3) survey, and 27 participants filled the second (S1) and third (S3) survey. 18 participants filled all three surveys. Two different paired tests were performed. For a pairwise comparison (S1-S2, S1-S3, S2-S3) a Wilcoxon signed-rank test was performed. The complete set (S1-S2-S3) was subjected to the Friedman test. Mean values drop by 26% from 3.8 to 2.8 for S1-S2, leading to a p-value for no improvement of 0.0008. For S1-S3, the mean value drops by 42% from 3.3 to 1.9, with a p-value of 0.006. Results for S2-S3 show a decrease of 13% from 2.4 to 2.1 with a p-values of 0.28. The analysis of the complete set results in a p-value for no improvement for the Friedman test of 0.088. The latter two results suffer from low sample size. Figure 5 shows the change of mean values of the different paired tests in comparison to the unpaired test. Ongoing surveys will lead to increased sample sizes, smaller uncertainties in paired tests, and more solid results. www.healthoutcome.org is a crowdsourcing platform that rates interventions for lower back pain (among other conditions). Among the interventions with over 250 ratings, the frontrunner by a large margin is Postural Modification with a rating of 3.8 out of 5. 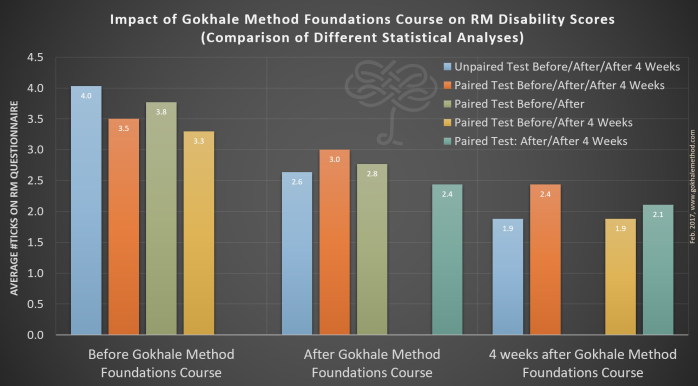 Among all rated interventions, the Gokhale Method, with 45 ratings, is the top scorer at 4.5. This data, since it is compiled by a third party, and since there is truth in numbers (over 40K ratings collected for lower back pain, a higher number than could ever be contemplated in a controlled clinical trial), deserves serious attention. Dec. 27, 2017 edit: The Gokhale Method now has 136 reviews (and is still the top scorer), and Postural Modification is now rated at 3.7 out of 5. Interventions now require 500 ratings, rather than the stated 250, to show at the top of intervention lists. 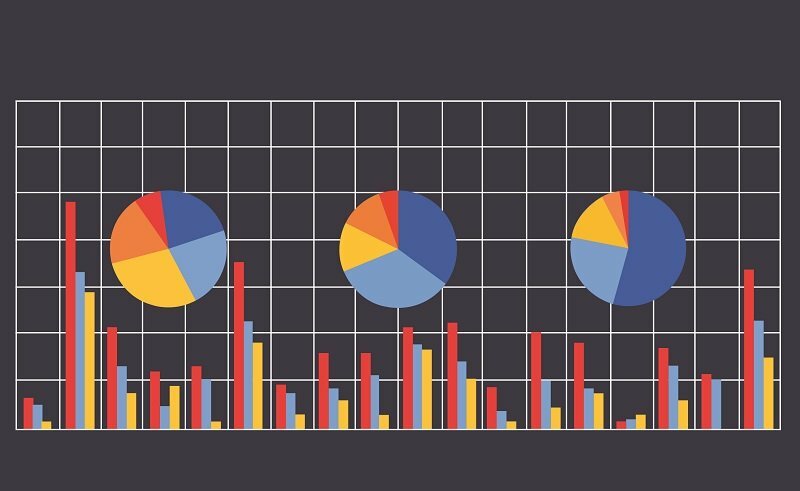 The low number of participants in this study limits the variety of statistical methods that can be applied to analyze the data. In future we hope to encourage greater participation in our surveys. Since all students, irrespective of whether they have any back pain, were invited to participate in the study, the study includes subjects who entered without any lower back pain (see Figure 3). This reduces the initial average back pain rating as well as the magnitude of possible reduction in back pain. In future studies, by including only participants who have back pain, we would expect to see even stronger results in comparison to other clinical studies (e.g. and  with mean values of 8 and 10.2). This study has no control group. We hope that the data we continue to collect, as well as the strong crowdsourced ratings at www.healthoutcome.org will generate interest in a randomized control trial. If you are interested in supporting or conducting such a trial, please contact us at [email protected]. 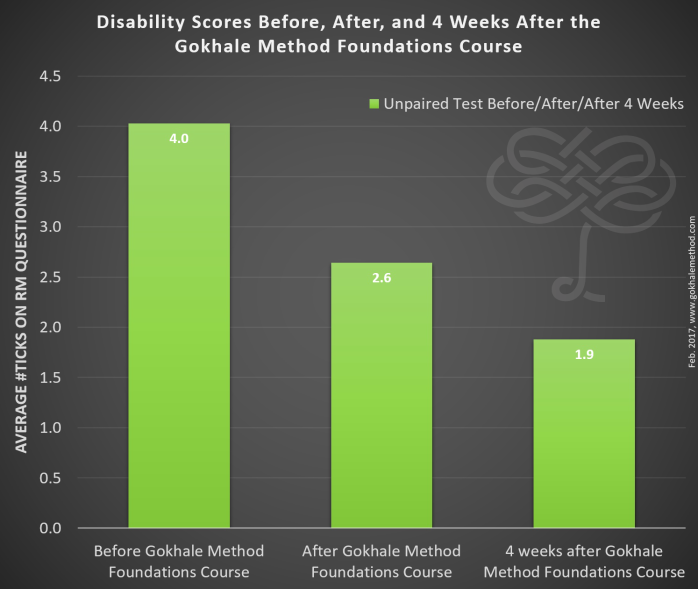 Though our study has limitations, the data suggests that the Gokhale Method Foundations Course has a large positive impact on our students’ lives. The size of this effect appears to be stronger than that reported in studies of other approaches to lower back pain. Given the magnitude of the problem of back pain in modern society, and the dearth of effective solutions, the Gokhale Method Foundation course merits further investigation. Roland MO, Morris RW. A study of the natural history of back pain. Part 1: Development of a reliable and sensitive measure of disability in low back pain. Spine 1983; 8: 141-144. The Roland-Morris Disability Questionnaire and the Oswestry Disability Questionnaire. Spine 2000; 25: 3115-3124. 1. I stay at home most of the time because of the pain in my back. 2. I change position frequently to try and make my back comfortable. 3. I walk more slowly than usual because of the pain in my back. 4. Because of the pain in my back, I am not doing any of the jobs that I usually do around the house. 5. Because of the pain in my back, I use a handrail to get upstairs. 6. Because of the pain in my back, I lie down to rest more often. 7. Because of the pain in my back, I have to hold on to something to get out of a reclining chair. 8. Because of the pain in my back, I ask other people to do things for me. 9. I get dressed more slowly than usual because of the pain in my back. 10. I only stand up for short periods of time because of the pain in my back. 11. Because of the pain in my back, I try not to bend or kneel down. 12. I find it difficult to get out of a chair because of the pain in my back. 13. My back hurts most of the time. 14. I find it difficult to turn over in bed because of the pain in my back. 15. My appetite is not very good because of the pain in my back. 16. I have trouble putting on my socks (or stockings) because of the pain in my back. 17. I only walk short distances because of the pain in my back. 18. I sleep less because of the pain in my back. 19. Because of the pain in my back, I get dressed with help from someone else. 20. I sit down for most of the day because of the pain in my back. 21. I avoid heavy jobs around the house because of the pain in my back. 22. Because of the pain in my back, I am more irritable and bad tempered with people. 23. Because of the pain in my back, I go upstairs more slowly than usual. 24. I stay in bed most of the time because of the pain in my back. Like what you read and want more? Sign up for our newsletter! You’re right: For those, who experienced the aha-moments during the course, and the comfort the Gokhale Method techniques can bring back in daily life (even when suffering from strong pain before), these results are no surprise. However, with this study we tried to set up an objective measure of the improvements. Although the study described in the blog post has some limitations, I think the results are an impressive starting point, and a motivation a) for the team to conduct and support more research, b) for the teachers to keep going with their great work, and c) for the students to participate in our surveys – we still continue this study. This study confirms what I have experienced for myself. There is immediate and sustained benefit of the Gokhale method in standing, walking and lying down. My back pain from walking and lying down has disappeared. I am very happy you are providing a strong validation study to document my own experience. The physician who did the NPR rebuttal on your method was way off base. I had been through a lot of physical therapy and while I had improved my core strength, it did not offer the significant pain relief your method has. Consequently, I have not had to seek more nerve blocks and ablation and I am still experiencing less pain than before the workshop. Thank you for your efforts to share your method with all of us who have suffered. Keep shouting from the roof tops! We're thrilled to have been able to conduct this validation study. Though it's our students' experiences that motivate us the most, the numbers help move the ball forward in a different way. We're looking forward to the day when back pain is rare. I like the use of a validated scale, the testing for significance for change and the level of detail presented. The amount of improvement from before and after is impressive, as is the increase in improvement from the end of the course to 4 weeks later. As you point out, the low response rate limits what one can say about the benefits for everyone; 62 clients provided the data for the comparison between the beginning and the end out of the approximately 500 clients to whom you sent the survey. Hopefully in the future you will be able to replicate these promising results with a larger proportion of those who took the course. Thanks for this positive review of our work. It is good to hear that you agree with the methods we applied. We will continue this kind of research in various directions - I’m very optimistic, that we’ll be able to decrease dropout rates in the future. Thanks for you comments on the aspects of the study that you liked! Yes, we would have liked more students to participate as well. For this round, the surveys were done online with no supllementary measures to boost participation. In future, we will look into the legitimacy of having our teachers encourage students to continue to participate in the followup surveys. I'm also wondering whether having our customer service team encourage particpation at registration is legitimate - we will find out. We were very strict with our protocol, for example disallowing responses outside of the 72 hour window (we had students call in explaining that they were on vacation when the survey was sent out and wanting their submissions to be accepted). We want to maintain this level of rigor and will be doing research on how to boost participation without losing rigor. As a researcher myself, I am totally thrilled to see this well designed project to assess the effectiveness of the Gokhale Method come to fruition. Although it does have some limitations (especially sample size on follow through), the results are impressive and make it worth continuing. I wonder if a second (or third) "reminder" email would have brought in more of the later surverys. But the assessment tool used and testing at three points in time were very appropriate. Ever since I completed the Foundations course with Esther in Palo Alto many years ago, I have wondered why no assessment research was being done. There was frequent mention about a study by a doctor at PAMF, Haleh Agdassi, M.D., and although I asked about this study often, it never seemed to happen. Do you know if she is still involved in,or considering, any reseach using her own patients? Is she aware of this new study? Thanks so much for this great work. Keep it up and get it publicized. Dr Agdassi was advised by the IRB who reviewed the propsed study that because of the small proposed cohort sizes, the results were very likely to be inconclusive. This was a bit of a damper for everyone involved. After reading the point of view of Nobel Prize winner Daniel Kahneman in Thinking, Fast and Slow, in which he describes the fatal mistake many researchers make of picking too small a sample size to show the effect they're researching (and thereby shooting themselves in the foot for future funding), I decided that we had better gather some in house data first on effect size before we embark on the next step of an RCT. RCT's are not trivial pursuits. When we get there, we want it to have the right cohort size. And funding! It's great to hear from you, Pat - I remember you well! Registe-se para receber notificações sobre os nossos posts e muito mais!